Eliana, Addis Ababa are catered especially for you. (named after the most sacred quarter in the home of the Gurage People) 4th Floor. Our Italian fine dining restaurant is the latest hot spot in the city waiting for you with royal treatment. Enjoy ataste feast in our Degeman restaurant. The menu offers fusion twists on Italian cuisine and a selection ofscrumptious dessert to wrap it up. An open Barbeque & Grill Terrace Restaurant serving steaks, tasty pork knuckles, Spare ribs and Pizza to pamper your taste buds.We offer a wide selection of Alcoholic beverages like premium mock tails,cocktails, shooters and Juices.Ideal for social event or private party, open between 2pm and 12am. Dress Code: We encourage formal/smart casual dress code. The envious environmentintimate with oversized floor-to- ceiling windows carry the aroma of traditional coffee beans and “High Tea” lingering around the lobby area Healthy and dietary bites from salads to deserts and light dinner menu complement the inspired beverage program. 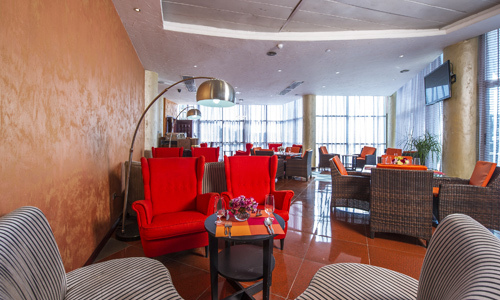 High on the 12 th floor, Altitude bar presents a panoramic view of Addis Ababa with lively music selection for your ears from our in-house DJs, bands and performers.Fine selection of international wines and liquor with delectable culinary offerings. unwind oneself from a hectic life. 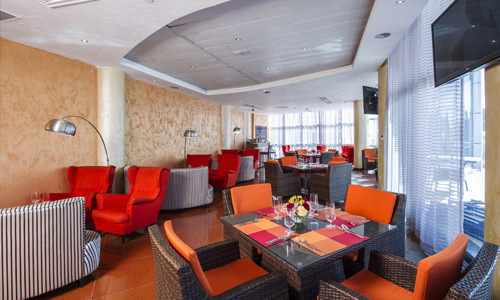 Eliana Hotel, Addis Ababa is an upscale business hotel harmonizing international facilities with the legendary Ethiopian hospitality, offering 80 aesthetically appointed guest rooms & suites. It cartels along a range of restaurants and lounges, meeting and event venues.